With immune boosting probiotic & Vitamin C.
All natural for a healthy urinary tract. No. 1 Pharmacist recommended brand. Benefits of cranberry juice in a tablet! Helps you maintain a healthy urinary tract. Urinary tract infections are caused by certain bacteria. Studies have shown that cranberry helps block the attachment of bacteria to the urinary bladder wall. 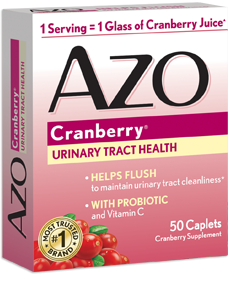 Only AZO Cranberry provides Vitamin C and a probiotic in addition to cranberry to maintain urinary tract health and stimulate you immune system. AZO Cranberry contains no milk ingredients, artificial dyes, colors, preservatives, flavors, yeast, wheat or gluten. No. 1 Pharmacist recommended brand claim based on Pharmacy Times 2007 OTC Survey. For maximum protection against bacteria attaching to the urinary bladder wall, take up to six tablets daily.